Minimizing and Managing Potential Basement Water Problems. As I began writing this article my phone rang and a gentleman from a prior inspection asked about repairing some downspouts that weren’t functioning properly. As a result the rain water coming off the roof was being dumped too close to the foundation of the house and this gentleman needed it to be repaired as recommended in the inspection report. As I learned in my home inspection training, approximately 90% of water that ends up in the basement comes from the surface of the ground. Not from a high water table or underground springs. Therefore if you can manage and maintain the gutters, downspouts and down spout extensions you can significantly reduce the potential for water from getting into your basement. New homes with basements are constructed with a set of perforated pipes around the perimeter of the foundation close to the footing. The footing is the portion of the foundation wall upon which the wall, and the rest of the house, stands. It is made of concrete and is wider than the foundation wall and is well below the frost line. The footing provides the house with its base making contact with the soil below. 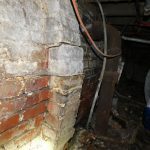 The perimeter drain is a pipe that sits very close to the footing and is routed around the foundation and is connected to the sump pit in the basement. The purpose of this perimeter pipe is to relieve the hydraulic pressure that may be created from high amounts of ground water. Instead of the ground water applying pressure to the foundation wall and perhaps seeping into the basement, the components (perimeter pipe, sump pit and associated sump pump) gives the water a place to go, be collected (in the pit) and discharged (via the sump pump) BEFORE it enters the interior of the basement. This is a good way to manage the water once it seeps against the foundation wall and toward the footing/drain pipe/sump pit area but it would be better water management if we could keep the water away from ever getting that close. And to help accomplish that we will look at gutters, downspouts and the important downspout extensions. The tools to manage rain water include the collection of the water as it is repelled by the roof shingles and into your gutters. Gutters should be properly secured, of course, and properly sloped so that the water is drawn, by gravity, to the lower parts where the downspouts should be connected. Occasionally I inspect a house where the gutters are not slopped properly and water can remain sitting in the gutters with only evaporation as a way for it to go away. Gutters should also be properly sized. If it’s an estate home, gutters with wider openings may be necessary to handle the large volumes of water that may come off the roof. If a gutter is undersized or if there is a clog preventing the water to flow to and through the downspout, the gutter will overflow. An overflowing gutter or a damaged gutter/downspout system can both lead to too much water being too close to the house. The downspouts should be secured with screws to the gutter and each downspout section should also be attached with screws. 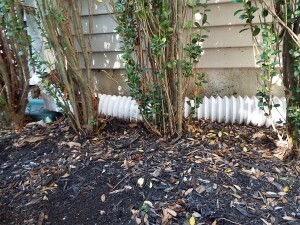 Simply relying on the friction fit of one downspout section connected with another is not sufficient to keep the connection intact for a long time. Splash block too close to the house. Downspouts often deposit the water onto a “splash block”. A splash block may be made of concrete or of a plastic material. While one purpose of the splash block it to disperse the water a more important function is to direct the water away from the foundation. However, splash blocks are usually 2 feet long and therefore the water run off is landing on the ground only 2 feet from the foundation wall and that’s too close. Downspout is to the right. Notice the left is higher. The water will not climb uphill! So to get the water further away we can use downspout extensions. Downspout extensions may be rigid metal just like the downspouts themselves or they may be flexible, corrugated plastic. No matter the material, good connections and proper slopes and distances are the key. 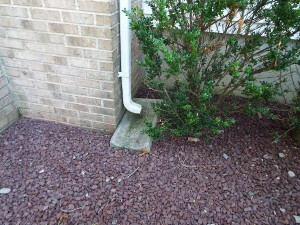 According to The Home Reference Book by Carson & Dunlap, the downspout extensions should effectively deposit the water at least 6 feet from the house. This will help ensure that the water, once it hits the ground, will probably not seep back into the basement. A longer distance is even better. Additionally the grading of the soil around the entire perimeter of the house should slope down at least 6 inches for the first 6 – 10 feet of horizontal distance. This will help ensure that any groundwater will be channeled away from the house. Make sure your gutters and downspouts are properly maintained and are clear of debris. Make sure your downspout extensions are sloped properly and at least SIX feet long. Make sure the overall grading of the land around the entire house is slopped so that any surface water is likely to flow away from the house, not toward the house. Doing these things will help promote a drier basement. 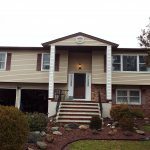 Make sure that when you hire an inspector you hire someone with the experience of Regal Home Inspections, LLC. My mother is 85 years old and when I do an inspection for an older client I approach it as though I was doing the inspection for my mother. Similarly, I have done inspections for young ladies and when I do I approach it as though I was doing the inspection for my 23 year old daughter. I take a personal interest in my occupation and all of my clients. It’s not just a job.